Some more parts finally turned up. Adam is there anything missing there do you know in terms of brackets and clips. No mate. Those 2 grey holders you won't need. 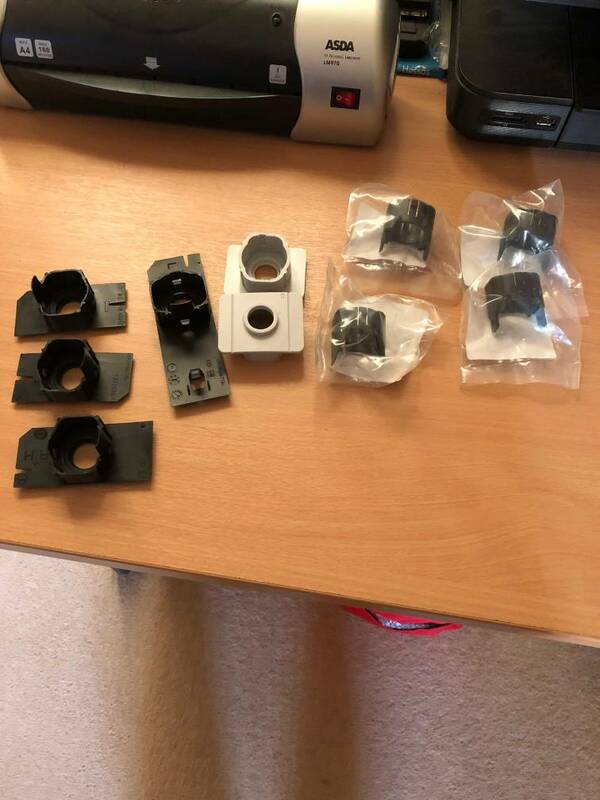 Just the 4 black ones (sprayed red first of course) then the clips in the packets sit inside the holders and that allows the sensors to be clipped in. I ordered what was on your list so did the grey ones come with something else ordered? I ask as I was away and the mrs split everything out to take the pic above, I am guessing they came with one of the black ones as part of the centre kit? Also with the LH & RH are they as you look at the outside or inside of the bumper (as in when the bumper is fitted they are LH or RH on the car). Last edited by Deathace; 3rd November 2018 at 08:49 AM. The grey ones I think are for a non vxr. I've actually ordered a set before confusing them with those back clips. As for the LH and RH I can't exactly remember. What I think I did was just test slot them in and see where they fitted best. You should get the right place purely by this. My kit came with 2 of those flat rectangular ones and 2 rounded holders. Dunno why your kit has 4 of the flat rectangular ones. Gm are always messing with the parts it seems. Well I got home Friday to see my screen was knackered so perfect time to replace it with the sight and light screen. Just need to find out where the wiring goes from and to and then get the sensor sorted and programmed in and I need an auto AFL headlight switch to get the auto lights and wipers to be selected. I have sussed the park pilot setup based on some google images of the rear of the bumper with them fitted. I also found out they plastic welded or fused the brackets to the bumper at the factory so I think I will use gorilla glue as that is good glue but allows a little flex as required. Last edited by Deathace; 8th November 2018 at 07:30 AM. Who tf did that to the screen? As for the bracket glue I also used a similar glue. Ultra strong stuff from a sealant gun. I came back from being away at work for the last 3 weeks and when I went to use the car saturday I noticed it, the wife tells me there was a mad hail storm last week so were going on that theory, there were too many small cracks elsewhere on the screen to indicate 1 impact. My AFL setup is basically the same as from factory, I bought a complete loom for the car I bought the AFL from which included all the front end wiring, the afl module and all wiring from front to back and at present the headlight switch without adjustment button, this I need to change for an auto light one which is bloody hard to find. I have looked over the wiring diagram and the sensor and mirror both wire in to the rec fuse 17 and the green can wire goes into the UEC (I hate adding stuff to here) once that is done I can program them in. Have you got that level sensor which clips onto the rear beam also for the afl?